Shuffle all creatures from your discard pile into your deck, and give them +5/+5. 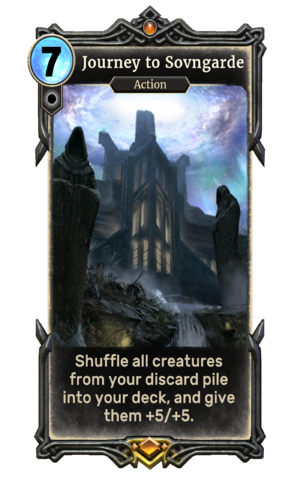 Journey to Sovngarde is a unique legendary Neutral action card. It is part of the Heroes of Skyrim expansion. The card's ability applies the Shor's Hall card effect. The card's ability was previously "Shuffle all creatures from your discard pile into your deck. Give them +5/+5 and reduce their costs by 5", until this was changed in Patch 1.70.2. Sovngarde is the Nordic afterlife which made an appearance in Skyrim. The card's name and card effect allude to Skyrim's Sovngarde quest, which featured a journey to Sovngarde and to Shor's Hall within.